A dairy digester project based in the Pixley area was recognized by BBI International and Biomass Magazine at the 11th annual International Biomass Conference and Expo in Atlanta, Georgia. Calgren Dairy Fuels was presented with the Groundbreaker of the Year Award for the 14-dairy farm digester-to-renewable natural gas project the company is currently developing. The award is a means to recognize the efforts to advance the bioenergy industry by breaking ground and making significant strides on a commercial-grade biomass-to-energy project. 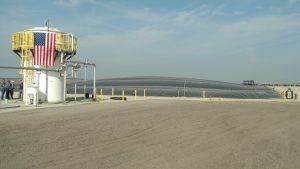 In California, these types of projects can be provided with funding assistance from the California Department of Food and Agriculture’s (CDFA) Dairy Digester Research and Development Program (DDRDP), with a goal of reducing greenhouse gas emissions. The funding is made possible by California Climate Investments and so far, CDFA has provided $8.2 million to help fund six different projects that are supported by Calgren Dairy fuels. The dairy digester project that received the award is one of the many ways the California dairy industry is working to become even more environmentally conscious. The DDRDP has been essential in the development of digester projects in the state. California has become the leading state in methane emission reductions achieved through dairy manure digesters, with 21 digesters currently in operation and approximately 20 more in various stages of development. The California dairy industry has also made progress in sustainable practices through the adoption of solar power. There are now over 100 dairy farms throughout California that are employing the use of solar energy panels. Many of the solar projects on California dairy farms are large enough to offset the emissions of 297 passenger vehicles driven for one year. Not only are these types of endeavors helping to lower the dairy industry’s environmental impact by reducing emission levels, they also help dairy farmers offset some of the costs of production.